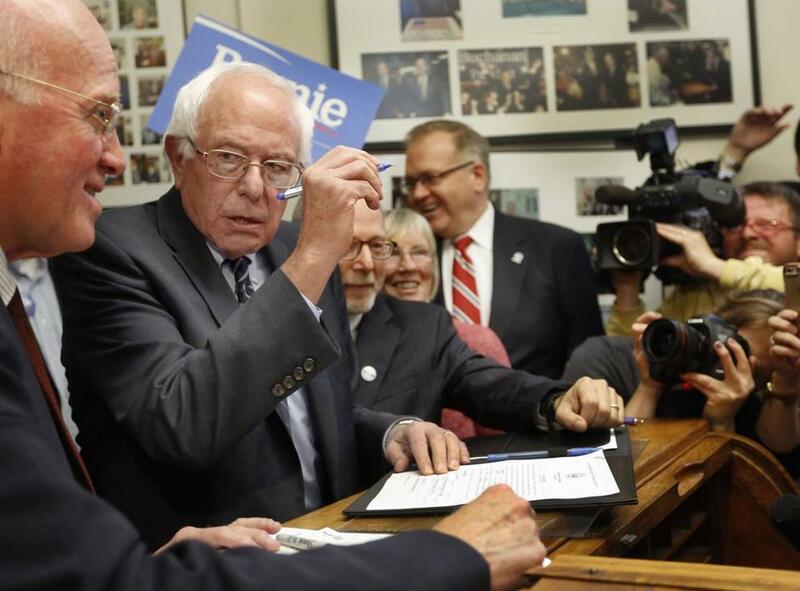 Democratic presidential candidate Senator Bernie Sanders signed papers to be on the N.H. presidential primary ballot. CONCORD, N.H. - Presidential candidate Bernie Sanders successfully filed for the New Hampshire Democratic primary Thursday, just days after Secretary of State Bill Gardner left uncertain whether he would allow the independent US senator to do so. Sanders arrived at the State House a little before 3 p.m. to enthusiastic cheers from a crowd of about 200 supporters. He was accompanied by Raymond Buckley, chairman of the New Hampshire Democratic Party, who was there to support Sanders’ filing in case any challenges were made to his status as a member of the party. “That’s it,” Gardner said after Sanders signed the official paperwork. Someone could still potentially challenge Sanders’ filing later in the month. If a challenge were to come, it would be on Nov. 20, the end of the filing period, when any other complaints also would be considered. Sanders is technically not a Democrat in the US Senate, though he caucuses with the party. His home state of Vermont does not register its voters with a party. He then called on Buckley, the Democratic chairman, who confirmed the senator’s party allegiance. Sanders added that he would run as a Democrat in any future elections. As Sanders emerged from the State House, the crowd vigorously chanted, “Feel the Bern,” an oft-heard slogan of this campaign. His address hewed closely to the main points of his campaign stump speech, from his call for tuition-free state colleges to his condemnation of income inequality in the United States. “This campaign has been successful… because we are treating the American people with intelligence,” Sanders said. Greg Tuveson, 40, of Dover, spoke admiringly of the candidate. In the most recent New Hampshire poll, released by Monmouth University Polling Institute in New Jersey, Sanders stood at 45 percent in the state, 3 points behind former Secretary of State Hillary Clinton. Clinton is expected to file for the primary in New Hampshire on Monday. Dan Blomquist can be reached at daniel_blomquist@emerson.edu. Robert Way can be reached at therobway@gmail.com.